YouTube app stopped working in some Oppo android phones, and users are pissed off with this. 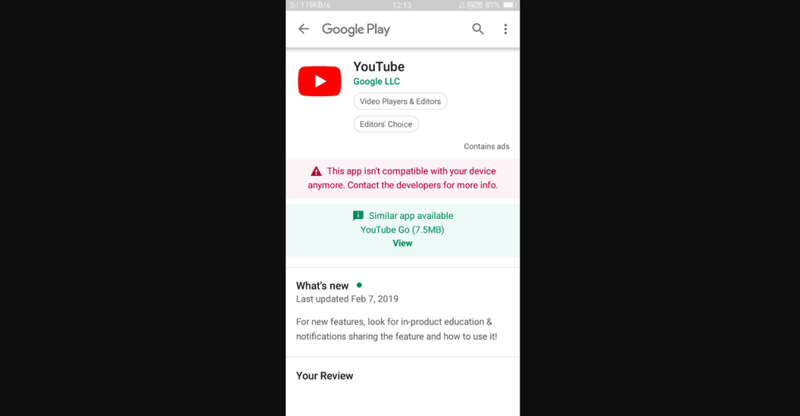 Lots of users reporting on the internet that after installing the latest version of YouTube app, they start seeing the error message which reads “This App Isn’t Compatible with your Anymore. Contact the developer for more info” on Google Play store in Oppo Devices. According to the responses on this thread on YouTube Help, the devices on which users seeing the incompatibility message are R9 Plus, A37, F1f, R9, F1 Plus, F1s, and others. All the devices have a 64-bit processor and run on Android 5.1. This a YouTube Android app compatibility issue with Oppo Android phone. To help out users, we decided to write this post covering all the possible solution to fix YouTube new update is not compatible with your Oppo android phone. 1. Launch Settings on your Oppo device and then navigate to Additional Settings > App Management. Your objective is to reach Application Manager on your device. 2. In the App Management screen, switch to All tab. You will get a list of all the applications installed on your phone. Repeat the same process for the YouTube app. 5. Launch Google Play Store and try to Download and Install the latest update for YouTube. This time it should work for sure. According to the information shared by on Oppo Australia Support page, the the devices listed above are not compatible with latest YouTube app. In this situation the only option you left with is to sideload the app from safe third-party apk sites. You can try apkpure and apkmirror, but in this blog post we’re going to use apkpure. Download the YouTube app apk using this link. Next following the on-screen instructions to complete the installation. Note: During installation, you need to check the box for “Unknown sources.” It is important. After doing this, you should be able to use YouTube on your Oppo device. YouTube Go is a lite version of the YouTube Android app. It is an alternate option released by the company. The application is handy for users with the unstable and slow internet connection. Note: Before installing the YouTube Go app on your phone. It is recommened to Disable YouTube app. For that navigate to Settings > App Management > YouTube. Here clear cache & data and then press the Disable Button. This will not only hide the YouTube app from the Homescreen, but it will also save storage on your device. At the moment, these are the possible solution which you can follow to fix YouTube “This App Isn’t Compatible with your Anymore” in Oppo phones. Find this blog post handy? Does the solutions discussed in this blog post worked for you. We would like to hear from you.